It was so nice to see this story in today's Vancouver Sun: Raising the bar: Here's one library that's giving back. 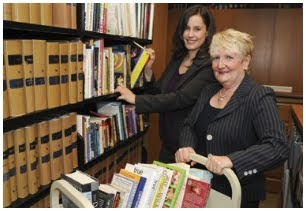 Local law librarians Kathy Barry and Wilma Macfarlane are featured describing their Fiction Friday program, and how they've raised money for charities such as the Raise-a-Reader literacy program, the United Way & the Union Gospel Mission. Congratulations to you both! Story photo captured below for posterity. Pacific Legal Tech '09 - Deadline Today! Reminder: If you were intending to register for this year's Pacific Legal Technology Conference, the deadline for the early bird price reduction is today! If you work in a law firm library, do yourself a favour and go read 3 Geeks and a Law Blog: Reevaluating BigLaw Library Services - Two Views. Great insight from Greg Lambert and Mark Gediman. Reminds me of an old post I wrote in Mar./05: The Law Firm Library - Customers & Consumers. Here we are four years later, and still walking that tightrope. Once budget pressures start, anyone who doesn't use the library (including most admin/operations mtg) will have little understanding of (or empathy for) the Library's role in providing legal services. The natural tendency is, unfortunately, to marginalize. Subject specialists (both research lawyers and librarians) are at times the lifeblood of practice groups; but without vocal lawyer support, almost invisible to administration. I enjoyed Mark's comments on making the Library indispensable, and see this as critical to the survival of the profession. We often talk about embedded librarianship, but this is where theory meets practice - especially for law firms. I say, put a tech-savvy librarian and an info-savvy technologist into a practice group for six months. Let them work directly with the lawyers - creating practice specific automations, document automations, cultivate precedent collections, research and KM organization. ... Generally optimize everything about routine business engagements at a matter level. Want a Susskind-ian vision for the future of Law Librarians? This would be a start. Breaking down a few silos. ... Lawyers with billable targets don't have the time for this type of introspective approach. A 'swat team' of others just might. Tracking and monitoring legislation is one of the law library's most critical tasks. Many librarians live in fear of missing or catching an important development too late. For BC researchers, Quickscribe Online is launching an alert service that may help, their new Bill Tracker. Developed over the past several months with significant input from various members of VALL, the beta RSS-based Bill Tracker lets researchers track new laws and amendments to existing ones. 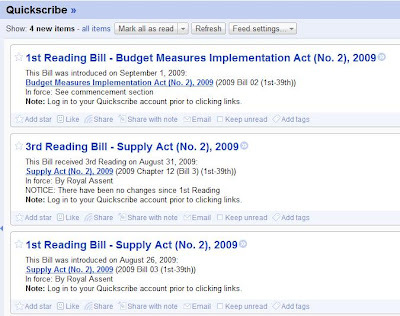 "Quickscribe’s new Bill Tracker (beta) uses RSS feeds to notify you when new legislation and proposed amendments are first introduced (1st reading) and again when (and if) the Bill achieves 3rd reading. Once notified, you will be provided with a direct link to the Bill so you can read the proposed amendments. If a Bill has undergone any changes from 1st to 3rd reading you will be able to easily compare the two versions side by side with the changes highlighted in colour. The Bill Tracker can also be used as an effective tool for catching consequential amendments that can easily get overlooked." The Bill tracker feed is now available for QS Online subscribers, and for those that sign up for Quickscribe's free trial. Quickscribe CEO Mike Pasta notes that the service is "especially useful for tracking consequential amendments and for viewing any changes that occur from 1st to 3rd reading."